The Durdin or Weavers' Cottages were built by Alexander Durdin in the late 17th Century and inhabited by weavers, when weaving was at its height. Set facing onto the Main Street of the village of Clonegal in the County of Carlow, there were at one time six cottages in a row. The development now comprises of a pair of semi-detached, two bay, single storey dormer cottages with attic conversion. The dwellings were inhabited though not by weavers, up to the end of 1970’s. The kitchens often rang to the sound of music as the members of a generation now gone entertained themselves with songs, stories and music. It is understood from the sources in the Irish linen Centre in Lisburn that some of the finest examples of linen woven in Ireland in the 17th Century were woven in County Carlow. 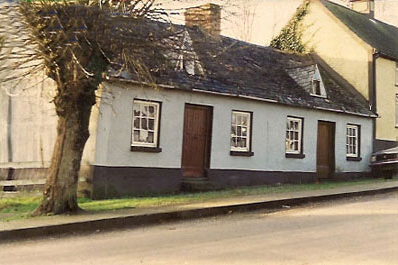 Uninhabited and derelict, the cottages were brought to the attention of Carlow County Council by members of the local “Keep Clonegal Tidy Committee” in 1998 (Photo right: The cottages in 1998). The village is fortunate to have a vibrant and energetic community, eager to retain their heritage. Following examination, it was considered that due to their historical importance and age, conservation was the favoured option. The form fabric and method of construction exhibit the typical local construction methods and style of the locality in the 17th century. The conservation of the Weavers' Cottage was considered by all to be an ideal project to exhibit good practice in the field of conservation, with the use of tradional methods using lime plasters, mortars and lime washed finish. It was also identified as an opportunity to strengthen the community’s links with the council, empowering local people to conserve part of their heritage, which in turn could be used for tourism promotion. Thus was borne the partnership for the project between the local community and Carlow County Council. The Tidy Village Committee took full responsibility for the management and implementation of the project and the council assigned Ms Mairead Phelan, Executive Engineer and specialist in conservation with responsibility for supervision. Following consultation with the local community a submission was made to the Department of the Environment and Local Government in 1999, for consideration under OPLURD - Operational Programme for Local Urban and Rural Development. The estimated cost of intervention was £50,000. Phase 1: Conservation of cottages and Phase 2: Setting up the cottages for individual use. The project was successful in securing a conservation grant of £20,000 towards Phase 1. Carlow County Council agreed to fund the balance and an agreement was entered into with the local village committee and the committee took full responsibility for the project under the supervision of Mairead Phelan. Work on the project commenced in 1999 and is being undertaken by two local workers employed by the “Keep Clonegal Tidy Village Committee”. A training course was held for workers in summer 1999. 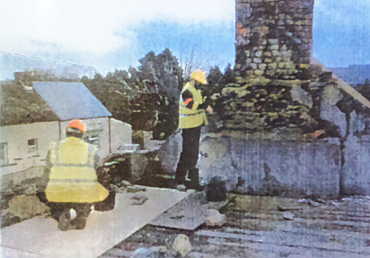 When the expertise of Cornerstone, kilcock was used to train operatives in the traditional methods of repairing stone and use of lime. A further worker was assigned to the project by Carlow Town & County Amenity trust under the FAS “Job Initiative Scheme” in May 2000. The opening of the restored cottages will be undertaken in conjunction with National Heritage Week in 2000. The Weavers' Cottages after the completion of the restoration work in the year 2000. The garden to the rear of the cottages will be developed using traditional methods like double digging, crop rotation, composting and a selection of vegetables.